The world's dominant Open-Class sport motorcycle receives extensive refinements to boost power, reduce weight, improve handling precision, and increase durability. Power output increased to 123 bhp and 65.8 ft/lbs of torque. Dry weight reduced to 396.8 lbs. Combustion chambers, intake and exhaust ports reshaped to reduce airflow resistance for sharper engine response. New RC45-inspired, aluminum composite cylinder sleeves are high-pressure formed from sintered aluminum powder impregnated with ceramic and graphite. The composite sleeves are 21.3 ounces lighter and provide better wear resistance and superior heat dissipation than the steel sleeves they replace. Redesigned pistons feature new LUB-Coat solid lubricant to minimize friction between the piston and cylinder wall. Carburetor vacuum piston size increased to provide quicker response to throttle transitions. 3-D mapped ignition module re-programmed to optimize engine performance, throttle response, and driveability. Aluminum silencer redesigned to provide 18 ounce weight reduction. New, compact eight-plate clutch features improved friction plate material and is 9.1 ounces lighter than the ten-plate clutch it replaces, maintaining overall performance and reliability. Transmission strengthened in key areas to provide enhanced durability under sustained, high RPM operation. New six-speed gearbox has revised ratios to improve overall performance and provide a 3% higher top speed potential. Radiator core enlarged and cooling system redesigned to improve cooling efficiency 6%. Frame thickness increased and swingarm pivot plates strengthened to increase lateral and torsional rigidity. Frame offset reduced 5mm, increasing trail by 5mm to enhance handling performance. Fork span increased 10mm to add torsional rigidity. New aluminum steering stem and lower triple clamp are stronger yet 15.3 ounces lighter than steel pieces they replace. 45 mm front forks feature RC45-inspired cartridge assemblies, now 5.4 ounces lighter. Front fork springs and damper settings are refined to improve feel and maintain superb handling characteristics. All-new tapered box section swingarm with increased lateral and torsional rigidity. Front disk rotor diameters increase from 296mm to 31Omm. Overall swept area increases 14% and brake components are upgraded for even better braking performance. Special Bridgestone tires have increased sidewall rigidity. Front and rear wheel rims redesigned to reduce unsprung weight while maintaining overall strength. Redesigned fairing, windscreen, mirrors, and rear cowl reduce aerodynamic drag 3% while maintaining distinctive Super Sport look. New dual-reflector headlight design features curved-surface lens and broader lighting pattern. Rider comfort improved with revised handlebar position, 5mm taller footpegs, and re-shaped footpeg side plate. New high-tech instrument cluster is 14.4 ounces lighter and 1. 6 inches thinner than old-style unit. Display includes electronic tachometer and speedometer and LCD readouts for temperature, odometer and two tripmeters. 1998 colors: Black/Red, Red, and stunning Pearl Yellow. 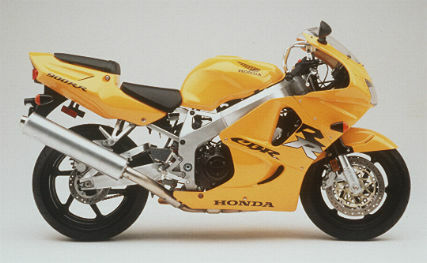 Ultra-compact 919cc DOHC liquid-cooled inline-four engine. 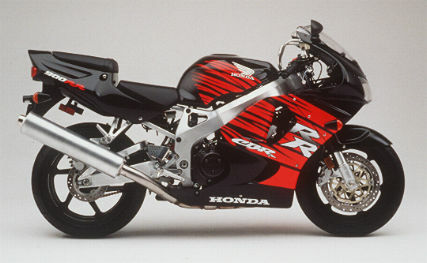 One-piece upper crankcase/cylinder assembly, right-side cam-drive design and a narrow, 32degree valve angle help make the CBR90ORR engine the lightest, most compact powerplant in its class. Sixteen-valve cylinder head and a radical, compact combustion chamber design offers 11.1:1 compression, allows efficient combustion, and promotes high horsepower production. Direct, shim-under-bucket valve actuation system is compact, ensures high-rpm durability, and allows 16,000-mile valve maintenance intervals. 38mm flat-slide CV carburetors combine with short, straight intake ports and a huge, 7.2-liter airbox for maximum intake efficiency, superb throttle response and maximum power. Spring-loaded scissors-type gear on the drive side of the crankshaft and a rubber-mounted floating clutch-cover help reduce noise. Liquid-cooled oil cooler and a light-weight curved aluminum radiator keep engine temperatures in check for consistent performance and long engine life. Maintenance-free features include a digital map-type ignition system and a mechanical, automatic cam-chain tensioner. Weight-saving features include a compact and lightweight one-piece alternator, compact 8-ampere/hour battery, and a magnesium head cover. Large-volume aluminum muffler helps increase power and torque. Lightweight, tuned frame with triple-box cross section and light, open-ribbed die-cast swingarm-pivot plates offer excellent torsional and lateral rigidity for excellent handling and feel. Pro-Linkg rear suspension features a high-quality HMAS remote-reservoir damper with spring preload, rebound damping and compression damping adjustabilitv for superior rear wheel control. Braking system features huge, full-floating 310mm discs and four-piston calipers up front, along with a 220mm disc and single-piston caliper in back for exceptional stopping power. Aluminum-alloy super-light U-spoke wheels feature race-spec 3.5-inch front and 5.5-inch rear widths, and carry Bridgestone BT56 radials that offer superb grip, linear steering characteristics and exceptional compliance. HRC-designed fairing offers superb aerodynamics, excellent wind and weather protection, light weight, and quick-release panel fasteners. Durable, sealed #525 0-ring drive chain. Rubber upper-rear engine mount minimizes vibration. Key-lockable 6-liter rear cowl storage box, designed to hold most commonly available U-type and cable locking devices (not included), is located under the passenger seat. Specially shaped front fender lowers aerodynamic drag and reduces lift. Molded indents help draw air up the fork tubes and into the cockpit to reduce negative pressure on the rider. One-year limited, transferable warranty with no mileage limit.